Some day I will get to read a fiction/mystery book that doesn't involved site word counts or cartoon characters......ahhhh but currently I have been trying to read a string of books on helping our kids and us survive daily life. I lost....yes lost....which means someone in a doctor office has gained an almost new copy of the Carol Barnier book I was trying to read on hyperactive children and homeschooling...very sad for me. But I did a random search on Amazon....have I mentioned that Amazon is my new FAVORITE place. My hubby got a prime membership because he is a student and I am addicted. I ordered this book Thursday and got it yesterday for FREE shipping!!! He may change his password on me because it makes it too easy for me to get books for schoolwork that the library doesn't have. I haven't gone nuts...but it is very easy. • How not to be rude. 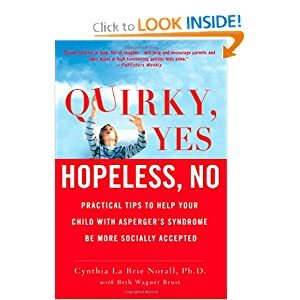 Based on Dr. Norall’s twenty years of experience diagnosing and treating thousands with Asperger’s, this book will share her insights gained from helping so many friendless Asperger’s children become more approachable, less stuck, and finally able to make, and keep, a friend or two. I'll let you know in a few days about this book, even exhausted last night I fell asleep reading it. Our week was definitely NOT boring!!! We started our talk about Geography of Greenland/Iceland by making a mini-doughnut recipe from Iceland. We made with them vanilla frosting and sprinkles, powdered sugar and cinnamon/sugar. We started working out of our workboxes again. I really need to keep myself better organized...which I am really trying harder to do. We had an addition to our school....Joey really likes this and his dad said that it really helped him. Even Lydia enjoyed playing a brief game against Daddy. The girls were invited to a really great Tea ﻿Party on Monday. Lots of good food, games and crafts. They had so much fun. This is them with their friend Amelia, who was also the Hostess. Tuesday--We had to say our Final goodbyes to our new Kitty Lion who developed Kidney Failure after his recent declaw surgery. It was rough. Tuesday We also had LEGO Club. The boys also had Agility Therapy. On Wednesday we had our Field trip to the Post Office in our little town. We really thank Barry for taking the time to show us the office and how our mail is sorted. Thanks for letting us help do some of the mail that day too!!! ﻿Lydia and I had our volunteer shift at the Humane Society. We went straight from our field trip to the Humane Society so we could pick up our new cat....Princess. We started our seed planters also. We are going to grow Kalidoscope Carrots, Sugar Baby Watermelons, Red Sweet Corn, Cucumbers and potatoes. Also some Jelly Bean Tomatoes! Those things are the best!! We did earn some prizes from the Treasure Chest this week. During Quiet time on Thursday I let Brayden play with his DUPLO Blocks. He builts a big tower. I wish I would've gotten a video of his happy dance. This shot was mid motion. He was very proud of how tall it was. No pictures from Friday. Kids had a free day becuase I spent time trying to scrap and paint the exterior of our garage. Very exhausted as I am finishing this post. Still have lots of painting to try and finish tomorrow. Will have to get some before and after pics to post. 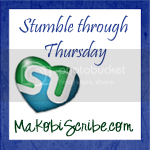 I was ever so grateful when my dear hubby was able to leave work early and help me do some of the scrapping. I was having a hard time getting off the ladder to crawl on the roof. I did manage to get stung three times today though. A bee got into the hood of my sweatshirt and I didn't realize it. I got stung on the neck twice and the ear lobe also. Ear is a bit sore tonight too. Plan on going to bed early tonight.﻿ The kids are watching a movie and then everyone will be crashing. We did a combination this week for our Geography Study. We looked at Iceland and Greenland. We learned that the majority of both countries rests above the Arctic Circle, and even though Greenland is the largest island country in the world, that it is not heavily populated. It also has the Capital that is the farthest north in the world. For our Global Art project, we adapted Scrimshaw. Fishing is a major industry for Greenland and in the past whaling held great importance. Whalers developed scrimshaw, or scratching and engraving lines into ivory whale bones and teeth. Ink was rubbed into the scratches, producing a picture. Scrimshaw was used for the whalers to record observations and stories they wanted to tell and remember. The art project said to use plastic dishwashing bottles cut into shapes and nails for the designs. I thought way too much for our crew, so we used homemade salt dough and chopsticks. Ástarpungar - Round doughnuts or "Love Balls". All towns and settlements of Greenland are situated along the ice-free coast, with the population being concentrated along the west coast. The northeastern part of Greenland is not part of any municipality, but is the site of the world's largest national park, Northeast Greenland National Park. If the Greenland ice sheet were to melt away completely, the world's sea level would rise by more than 7 m (23 ft). Seal and reindeer is a staple meat in the diet. Iceland is the home to many active volcanoes. Iceland is very proud of their Viking heritage. Freak winter storms can strike at anytime. Domestic dogs are not allowed north of the Arctic Circle for fear of weakening the breeding of the strong sled dogs. We learned about the Animals of Greenland and Iceland. The polar bear, walrus, reindeer, musk ox (named for their smell), blue whale, Icelandic horse, Icelandic cow, Icelandic sheep, Icelandic dog. We get these from Netflix...and I highly recommend them!!! The boys got mad the last time I didn't print flags for them to color, so I didn't make that mistake again. 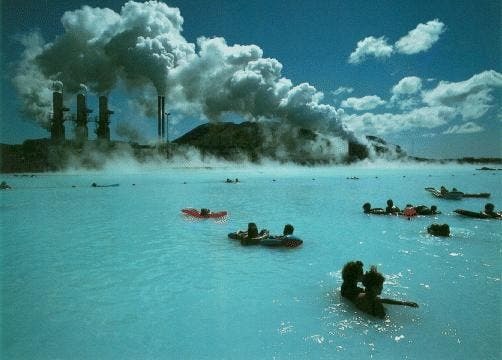 Due to the special geological location of Iceland, the high concentration of volcanoes in the area is often an advantage in the generation of geothermal energy, the heating and production of electricity. During winter, pavements near these areas (such as Reykjavík and Akureyri) are heated up. Neil Armstrong and crew trained for the moon landing in the rough sections From Lake Mývatn in the north of Iceland, the Askja Lunar Tour journeys through the surreal lunar landscapes and areas of unique geological formations, which now form part of Vatnajökull National Park, Europe’s largest protected wilderness. It is believed that Armstrong called the moon a letdown to drive on after being in Iceland..but that was all speculation. Next week we will be visiting Ireland. How do I summarize our week?!? It was a roller coaster ride. The oldest has started to have something similar to manic episodes. Well it feels like we all have to walk on egg shells because we are just not sure what things could trigger it. It's been stressful on Joe and I and I know that it is trailing down to the rest of the kids also. This though brings out all kinds of arguing and bickering since Lydia finds it funny to get Joey started screaming. Watching her though has brought a whole other set of worries into my head. I am trying not to over look at things, but ughhh it feels like we are drowning daily. But each day we wake up for a new day and we still stick next to each other. Even with mini-bickering with each other because of all frustration we know we can rely on each other because only the two of us know what it is really like on a daily basis. We got a little behind in classes. We were working on Time 4 Learning though (for a product review to be posted in about two weeks) for Math. We did finish our study of Greenland and Iceland in Geography. We didn't get our weather unit started because I didn't get all of our books in. So we will be starting that on Monday. To the State of Ohio's standards we have completed 880 hours of the 900 required for the school year. Since we piece together our curriculum according to interest, well life goes on. We'll keep chugging along at all of our projects until they are complete. They just be listed on our next year. Who says we have to finish all of our curriculum each school year. The Flexibility of homeschooling!!! This week, Lydia and Caty had a tea party at a friend's house. The boys didn't have soccer due to the weather (lots and lots of rain and wind). The girls also didn't have soccer because of this. But we did do our volunteer time at the Humane Society and visited the post office here in our town. We also had LEGO Club this week. Not sure what favorite time was. It was nice to get some things done in the garage (that's code for emptying out lots and lots of garbage). It was nice to see Caty riding her new Barbie bike. I did enjoy watching Lydia's face light up when we did our volunteer work at the Humane Society. The look on the boys face during the Globe Trekker video on Greenland where they were eating fried fat was pretty good too. So far I am noticing that morning work is working better for us than afternoon. Also using the workboxes is definitely better than not using them. Does anyone have any disciplinary techniques that work with kids with Aspergers? Or is anyone familar with Bi-polar and have any calming techniques for manic episodes? I ordered some more books to read and hope to find some new calming methods, but any suggestions that have worked we would appreciate hearing them! The new cat we brought home from the Humnane Society...meet Princess. A benefit of living in a small town. Small post office and they know everyone! So our really nice Postmaster said he would allow the kids to visit this morning to see behind the scenes at the post office. The room where the truck delivers the mail each morning. Then it goes to the sorting tables. The is one area for the rural routes. Barry shows Joey how to scan in a package. Brayden gets a turn also. They all got to use the scanner. Lydia got to scan the mail delivery complete. Then he showed them how they "cancel" local envelopes for delivery. They all got a small stack of letters to cancel. Joey really liked it, actually did a lot of stamping. Lydia got to put a few pieces in the boxes also. Thanks so much to Barry for letting us visit his world. Our theme for the month was food, but there was only a few people so the kids just built whatever they wanted. Here's Lydia with her house. Amelia made a cool creation. Brayden was building a house too. Joey was working on his pepperoni pizza. Another shot of her house.